Over the years these accomplished musicians have played together in various combinations. Most recently Frankie and Paddy played with Junji Shirota on the recording Eire Japan, and Frankie and Dermot played with others at the 2017 Patrick O’Keeffe Festival. Their first public outing as a trio was at Celtic Connections 2018 in Glasgow. 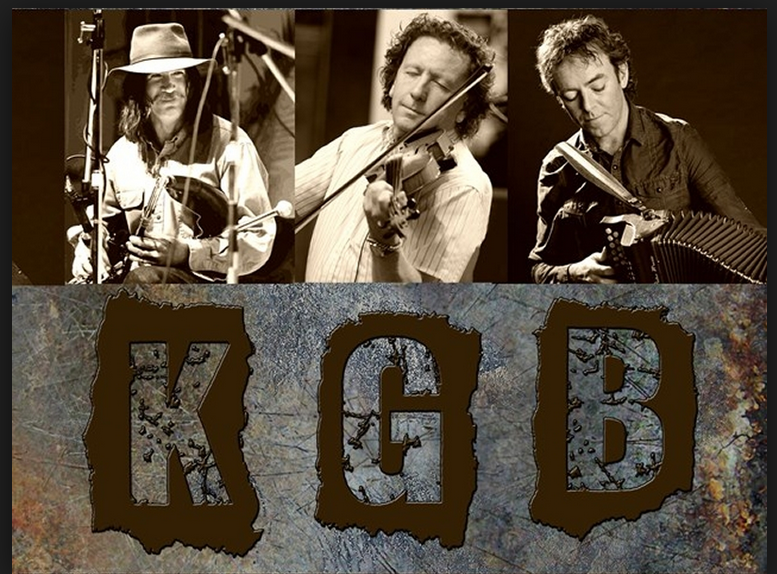 The main act was billed as KGB – Keenan, Gavin, and Byrne. Old friends Paddy Keenan and Frankie Gavin had a wonderful night poking fun at each other, with Paddy using his pipes to make chicken squawks and play “Happy Birthday” to himself. Always a comedian, Frankie raced through jokes almost as fast as he can fiddle. Dermot Byrne held down his end of the stage with a patient smile and incredible accordion virtuosity, whenever Paddy and Frankie were ready to play some tunes. This gig had so many highlights, from the running gag of Paddy’s first job as an egg-sorter (prompted by the chicken squawks), to old favorite tunes played by master musicians, to Dermot’s solo, and an unscheduled departure from traditional tunes to an old rock standard. Old friends playing beautiful music made for a grand evening. Next up, KGB. (Keenan, Gavin, Byrne) With such illustrious names from the traditional music pantheon, there is an air of expectation in the room, one which Gavin breaks immediately by telling a few jokes. This is his way of settling us in, ‘relax, we’ve got this’. The trio then treats us to a couple of high octane sets, waking the audience up to the fact that they’re in the presence of some serious musicians, both technically and spiritually. The banter continues to attempt to mask the sheer brilliance on show here. Each of the trio has their own ‘spot’ where they play tunes of their choice, Gavin’s choice also showcases the prowess of his fellow musicians, he just can’t help be a leader. Byrne’s solo spot basically show us that he’s in that company for a reason, blistering ability and brought with a bit of a smile to boot, showing us that we need to watch the quiet ones. Keenan takes the route of playing a slow air, shying away from technical pyrotechnics this time, having treated us to quite a lot of that already. The trio have a number of gigs coming up in the next few months. Check on Forthcoming gigs page.